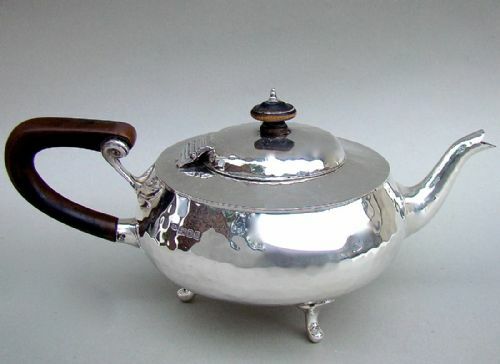 This is a very distinctive solid silver Art & Craft teapot made by Charles Edward, renowned Arts & Craft silversmith. The teapot of squat circular form with a spot hammered finish and slightly domed hinged cover. The unusually elongated wood handle with exquisite sinuous silver leaf terminals . Raised on three bracket feet. Date letter "c" for 1918. Length: 26cm / 10 inches. Diameter: 15cm / 6 inches. Stands firmly on its feet. No split to the wooden handle or finial. Postage UK: £11 Special Delivery Next day. Postage overseas: £25 International Signed For. This very elegant Edwardian silver bread basket was made in Sheffield 1907 by the very sought-after firm William Hutton & Sons. Of navette form, with rolled parchment finials and a fine gadroon border. The sides pierced with geometric patterns. Solid silver base. WH&S LD for William Hutton & Sons. Date letter "p" for 1907. Width: 16cm / 6 inches. Weight: 263g / 9.2 oz. 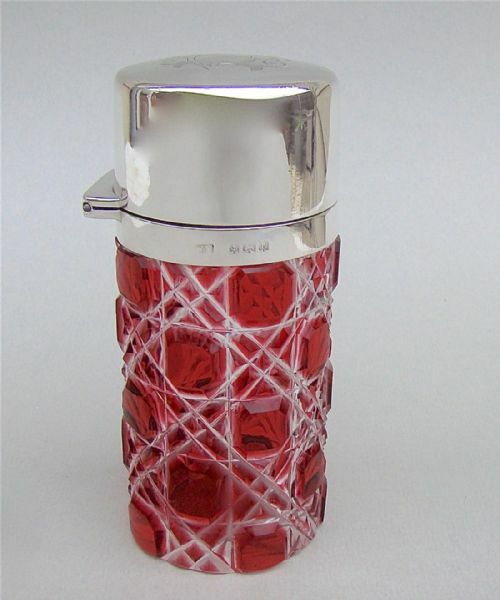 This is a stunning solid silver and hobnail-cut cranberry glass dressing table jar. 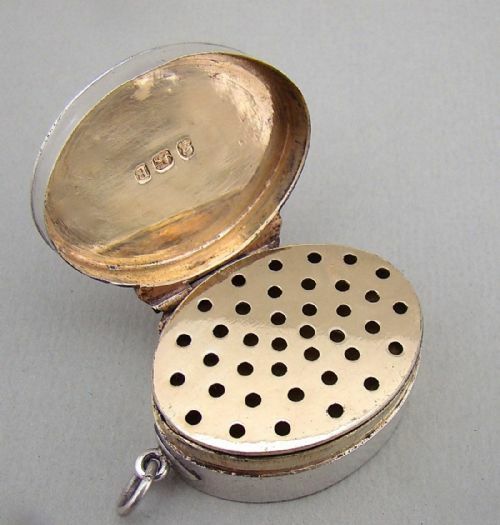 The hinged silver lid fitted on a cylindrical cranberry glass body hobnail-cut to clear glass in. Fitted with the original stopper. The top engraved with stylised initials. Date letter "h" for 1908. This delightful George III silver cream jug is dated London 1792 and bears the marks of George Smith II. 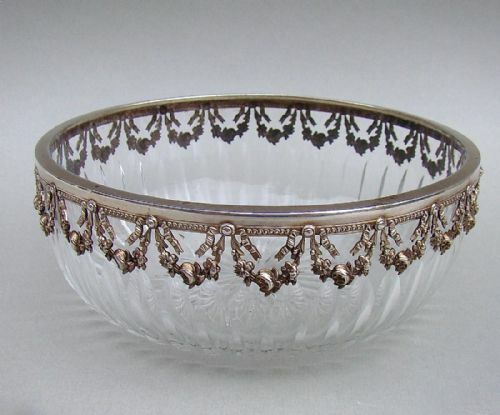 Of oval bellied form, with a pretty scalloped border, it is finely bright-engraved with prick-dot motifs surrounding a vacant reserve on both sides. GS for George Smith II. Date letter "r" for 1792. Height up to handle: 8 cm / 3 inches. Length from spout to handle: 11cm / 4 inches. Weight: 112 g / 3.9 oz. Maker's marks partially erased but identifiable. The plain oval body with a hinged cover opening to reveal a rich gilt interior. The pull-off gilt grille is simply drilled. The interior still retains its original sponge and the inner base is fully hallmarked. It is a very functional vinaigrette and is not as finely executed as the vinaigrettes made by Birmingham toymakers. This particularity makes it quite an interesting piece. Date letter "B" for 1797. This is a very unusual and elegant medium-sized silver mounted match striker. 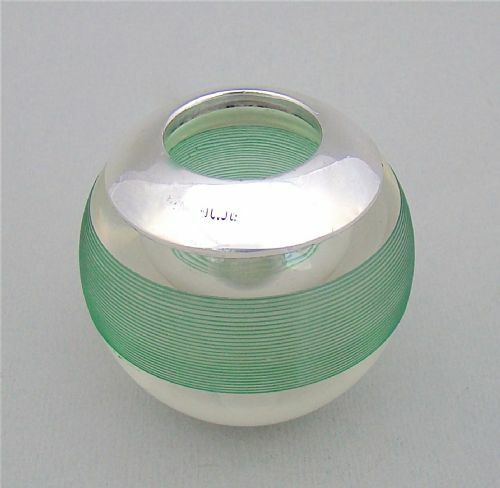 The clear glass spherical body applied with fine green glass piping, giving it the desired ribbed effect. The top with a wide silver rim. Often these were used on desks and doubled up as paperweights. Date letter "b" for 1902. Glass in very good condition. Silver rim with a few very minor dings, commensurate with age. Marks partially erased, which is very often the case with this type of objects. Height: 6cm / 2.4 inches. Diameter: 7.5cm / 3 inches. Postage overseas: £10 Standard parcel. 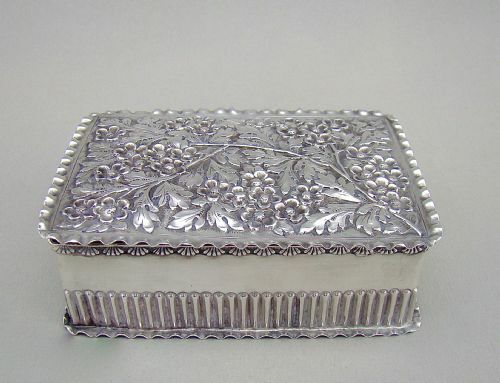 This is a very attractive and unusual Victorian silver jewellery box. Of rectangular form, the pull-off cover profusely embossed with flowering prunus. The base part fluted. The lid and base with decorative pinched borders. Date letters "p" for 1887. Height: 3cm / 1.2 inches. 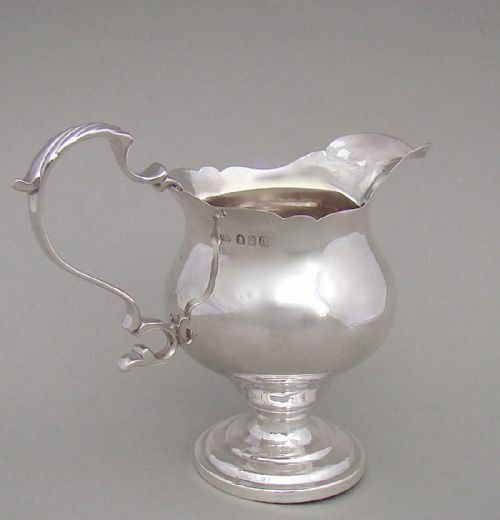 This exquisite Edwardian Britannia standard silver* cream jug was made by Maurice Freeman. The baluster body with shaped rim. Raised on a hollow pedestal base. * The Britannia standard mark: In 1697 a new high standard rate of silver was introduced known as the Britannia Standard. Britannia silver was an increase from the sterling standard rate of 92.5% to 95.84%. The reason for its introduction was actually a consequence of the English Civil War (1642 - 1651) during which massive amounts of silver had been melted down and converted into money to pay the troops. After the civil war ended, the demand for domestic silver rose astronomically and hence coins were being melted down to fulfil the demand. To stop the destruction of the coinage, the practice was deemed illegal in 1697 and the creation of the higher Britannia 95.84% rate was introduced to prevent silversmiths from using the sterling standard coins. In 1720 Sterling silver along with its original form of marking was reinstated. From 1720 up to the present day both Sterling and Britannia standards have been in operation side by side together. Although this is the case, the Britannia standard was rarely used until its revival in the late 19th century. 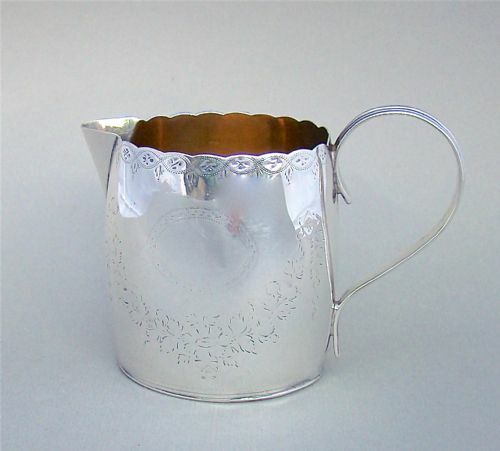 This cream jug is an example of the Britannia standard revival, which was happening in the late 19th / early 20th Century. Date letter "k" for 1905. No splits, dents or repairs. The jug sits firmly on its base. Height up to handle: 10 cm / 4 inches. Diameter at its widest: 5cm / 2 inches. Length from end of spout to handle: 11cm / 4.2 inches. 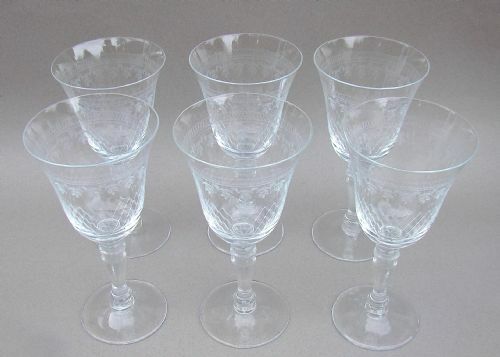 This is a tall and elegant set of six Edwardian Pall Mall wine glasses. Large wine glasses in this pattern are rather scarce hence quite desirable and very useable. Each flared bowl wheel-engraved with a scroll work border, above garlands of flowers and lattice decorations. Raised on a baluster stem. Diameter of bowl: 8.5cm / 3.2 inches. Diameter of foot: 7cm / 3 inches. 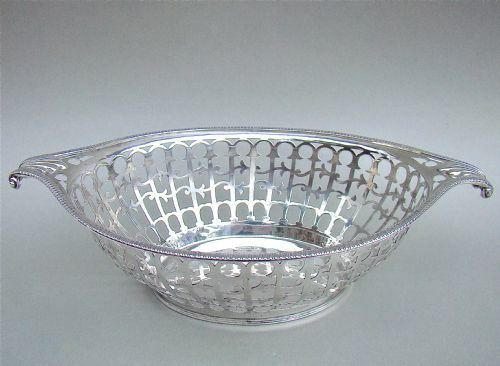 This is a very pretty silver mounted sliced-cut glass dish. The clear shallow body with vertical cuts and star incised base. The solid silver rim embellished with a ribbon-tied flower garland. German Crown and Moon mark. Diameter: 14cm / 5.4 inches. Height: 6cm / 2 inches. Glass in very good condiiton. Silver with traces of gilding. This is a fabulous Bohemian overlay glass vase. Of baluster form, it has three layers of glass. 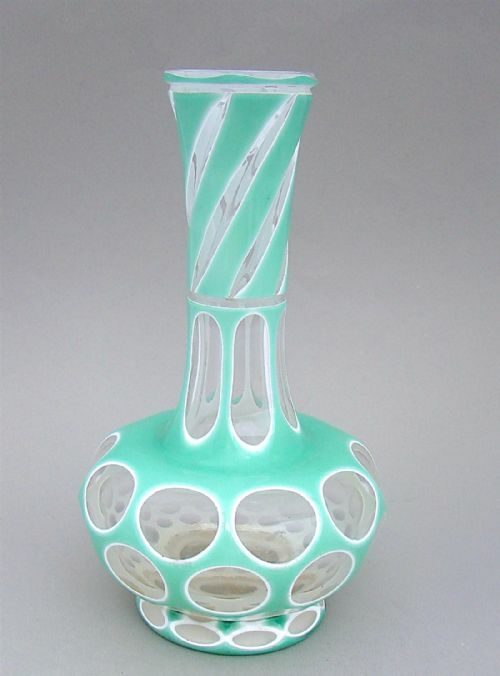 The pale green opaque body cut to white opaline glass then to clear glass with circular and geometric patterns. Height: 21cm / 8 inches. Diameter at widest: 14cm / 5 inches. A little rust discolouration at base. 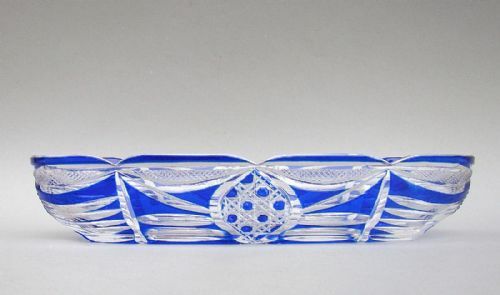 This is an exquisite sliced-cut Bristol blue glass dressing table dish or pin dish. Of oblong form, the Bristol blue glass cut to clear with hobnail and geometric patterns. It has a pretty scalloped and finely incised star cut base. Height: 4cm / 1.4 inches. Length: 22cm / 8.3 inches. In excellent condition, with the occasional only minute flea bite, consistent with age. Postage overseas: £ 8.00 Standard parcel.